I longed to see one for myself but I never did and gradually the wish faded. 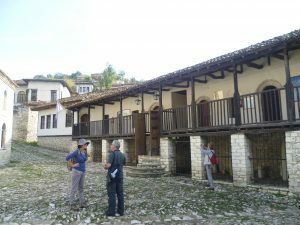 But last year I was in Albania, and there, beside an old, neglected caravanserai in Berat was a tattered hedge of white roses. Out of the corner of my eye, I saw a flash of emerald green. I went over, and this is what I saw. It’s strange how, suddenly, the world can be transformed. The rose was past its best but it didn’t matter. Suddenly, the years vanished and I was back in Corfu with the rose beetle man. It was a special moment. Always loved that book. More for the crazy family than the animals and insects, but know what you mean about the rose beetle man. Such a fascinating life Gerald Durrell lived. I agree about Gerald Durrell’s interesting life – though I’ve always felt rather sorry for poor Margo. The others had things they were interested in and wanted to do: writing, shooting and studying animals, but she had nothing. I think they were lucky to have been there in the 1930s, too. The cost of living was low and life was less regulated. I can’t imagine Gerry getting away with such haphazard schooling nowadays. And why didn’t Laurence and Leslie have jobs? They were both grown up? It’s a much loved book from my youth too – and my children love it in turn as much as I do. Not a vestige of Nancy, Larry’s wife, in it though she was certainly in Corfu with them before a child was born and the marriage broke up. There is a type of male author for whom a partner comes a long way second to their genius. Hemingway comes to mind. Young Gerry was fond of Nancy and obviously chose not to involve her in his portrait of his ramshackle family. Thank you for your comments, Pauline. I didn’t know about Nancy. I must say, I feel rather sorry for her, she can’t have had an easy time being Larry’s wife. Did anyone identify your find? Thank you for your comments, Steve. I’m delighted that you enjoyed the post and my photo. 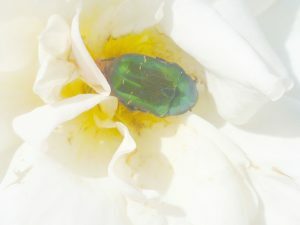 I checked the insect when I got home and it’s a rose chafer, and its Latin moniker is cetonia aurata. Thanks for that! Am reading My Family… for the first time. Utterly and undeniably charming, to say the least. 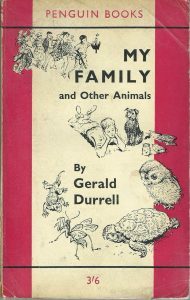 I’m delighted to have been able to introduce you to Gerald Durrell!